FAA has published Notice N8900.463, which removes the requirement for applicants to provide a complex aircraft (i.e., an airplane with retractable landing gear, a controllable-pitch propeller, and flaps) for the commercial pilot SEL and flight instructor-airplane practical tests. Note, however, that this change in policy affects only practical tests, not the training and experience requirements for commercial pilots and flight instructors. Those requirements, which are specified in 14 CFR Part 61, may change if an NPRM from May 2016 is enacted as a final rule. For more background on these proposed regulatory changes, see FAA Proposes Significant Rule Changes here at BruceAir. Specifically, [this notice] outlines the policy which no longer requires applicants for a commercial pilot certificate with an airplane single-engine rating to provide a complex or turbine-powered airplane for the associated practical test and no longer requires applicants for a flight instructor certificate with an airplane single-engine rating to provide a complex airplane for the practical test…[T]here are far fewer single-engine complex airplanes available to meet the ACS/PTS requirement, and the single-engine complex airplanes that are available are older airplanes that are expensive to maintain. Additionally, the FAA finds that removing the commercial pilot ACS requirement to furnish a complex or turbine-powered airplane and removing the flight instructor PTS requirement to furnish a complex airplane will achieve the same objectives. The FAA has determined that removing these ACS/PTS requirements will significantly reduce costs for persons pursuing a commercial pilot or flight instructor certificate by allowing applicants to utilize less-expensive airplanes on the practical test that are not complex or turbine-powered. The FAA has determined that any airplane may be used to accomplish the tasks prescribed in the initial commercial pilot with an airplane single-engine rating practical test or a flight instructor with an airplane single-engine rating practical test, provided that airplane is capable of accomplishing all areas of operation required for the practical test and is the appropriate category and class for the rating sought. Therefore, the airplane used for the practical test must still meet the requirements specified in § 61.45. There is no change to the complex airplane training and endorsement requirements of § 61.31(e) or to the commercial pilot aeronautical experience requirements of § 61.129(a)(3)(ii) or part 141 appendix D.
As noted above, flight schools will still need complex aircraft so that commercial students can acquire 10 hours of complex time. But commercial students won’t necessarily need to spend those 10 hours practicing lazy 8s, chandelles, power-off 180 landings, etc. to prepare for the practical test. Instead, they can use the complex aircraft to fly cross-countries, build night-flying hours, and so forth. They just need to log 10 hours and get the complex–and, depending on the airplane used–high-performance endorsements. They can then practice and prepare for the checkride in any aircraft that is capable of all the areas of operation in the ACS and that meets the requirements for the practical test. This change should help with the maintenance and other costs incurred when operating complex aircraft for training. CFI candidates, who presumably have acquired the 10 hours of complex time as part of their training for the commercial certificate, can accomplish all of their training and preparation for the initial CFI-A with a SEL rating in any suitable aircraft. This flexibility will save CFI candidates money, and it will make it much easier for flight schools to provide aircraft both for training and practical tests. Many flight schools have only one or two complex aircraft available, making scheduling difficult. And saving wear-and-tear on complex aircraft will probably improve their dispatch availability and lower maintenance costs. The FAA recently proposed several significant changes to regulations that expand the use of aviation training devices, training for the commercial pilot and certified flight instructor certificates, maintaining instrument currency, and other issues of interest to many general aviation pilots and flight instructor. Below are my comments on some portions of the proposed rules, which I have submitted to the docket. For all the reasons outlined in the proposal, I support the option to substitute a TAA (as redefined in the proposed rule) for the training and practical tests required for the commercial pilot and certified flight instructor certificates with single-engine-land ratings. One commenter objects that pilots won’t gain experience “with higher performing engine[s], retractable gear, constant speed propeller, etc.” But most flight schools offering training for those certificates rely on aircraft such as the C172RG or Piper Arrow, which have at most 200-hp engines. These are hardly high-performance aircraft, either as defined by FAA regulation or by their speed, sophisticated avionics and equipment, or handling characteristics. Pilots who want to fly aircraft with retractable landing gear, constant-speed propellers, turbocharged engines, and other characteristics typically associated with high-performance aircraft will still, as a practical matter, require checkouts and operating experience mandated by regulations (e.g., the endorsement required to act as PIC in an aircraft with an engine rated at more than 200 HP), insurance, flight school policies, commercial operator specifications, and common sense (a refreshing concept endorsed in the recent proposal to revise 14 CFR Part 23 aircraft certification rules—viz., “The part 23 regulations should not need to prescribe basic physical principles, sound engineering judgment, and common sense.”). The checkout required for aircraft like the C172RG or Piper Arrow is hardly a leap from a Skyhawk or Warrior. Instead, it’s a small step, and learning to operate and confirm the configuration of, for example, retractable landing gear, is only a small part of a complete commercial pilot or CFI training syllabus, and that basic training hardly prepares a pilot to fly a truly high-performance “complex” aircraft such as Cirrus SR22 (which has fixed landing gear) or a Beechcraft Bonanza. Similar examples: (1) Pilots with MEL ratings on their pilot certificates legally can fly any multiengine aircraft that doesn’t require a type rating. But in the real world, they must receive training and gain operating experience in specific makes and models to obtain insurance, fly rental aircraft, or act as PIC in a commercial operation; (2) Regulations require only a single logbook endorsement to fly tailwheel aircraft. But the handling characteristics of tailwheel aircraft vary widely (even among those that don’t have big engines, constant-speed propellers, etc.). Again, insurance, rental policies, and common sense oblige pilots who fly tailwheel aircraft to receive training and gain operating experience in specific makes and models. I applaud the proposed changes that would allow instrument-rated pilots to maintain currency with in any combination of aircraft, FFS, FTD, or ATD without requiring an instructor to be present. The current regulations are a deterrent to pilots who use ATDs. They must parse the rules and carefully review their logbooks to ensure that they have met the arcane requirements for various tasks, time limits, and calendar constraints. Instead of using training devices, today most pilots hop in their aircraft with a safety pilot (not necessarily an instructor) and repeatedly fly the same familiar procedures in their local areas, missing opportunities to practice the important skills of briefing and setting up a variety of DPs, arrivals, and approaches that include such elements as DME arcs and course reversals. They also typically don’t gain experience handling realistic equipment failures, challenging weather, and so forth. As the FAA notes, the proposed changes would encourage pilots to maintain their instrument skills. My experience as an instructor strongly suggests that it’s the mental, puzzle-solving side of IFR flying that deteriorates most quickly over time. Use of training devices is the most effective, efficient way to hone and maintain those mental skills. Pilots who want to use a training device at a flight school will still require at least an initial checkout on the equipment to ensure that they can use it effectively. Those checkouts are an opportunity for pilots to work with instructors to deficiencies in both their understanding of IFR flying and specific piloting skills, and those encounters will help instructors to develop relationships with pilots who otherwise might not be receiving training. Pilots are upgrading aircraft to include sophisticated avionics (even if the panel doesn’t meet the revised definition of a TAA). They are increasingly using tablets and other devices as substitutes for charts and to provide information about weather, traffic, and other details. Allowing pilots wider, creditable use of training devices that include, for example, GPS navigators, will help them develop and maintain the essential skills described in such publications as the Advanced Avionics Handbook and Instrument Procedures Handbook. Using training devices also gives pilots opportunities to practice using new technology and develop good operating procedures. The FAA is now proposing to define ATD in § 61.1 as a training device, other than a full flight simulator or flight training device, that has been evaluated, qualified, and approved by the Administrator. It’s not clear, however, if the proposed changes would eliminate the basic aviation training device (BATD) and advanced aviation training device (AATD) categories as described in AC 61-136 FAA Approval of Basic Aviation Training Devices (BATD) and Advanced Aviation Training Devices (AATD). The language in various sections of the proposed rules is ambiguous and should be clarified, and AC 61-136 and related policy guidance should be revised to ensure that both FAA and airmen throughout the system have a clear understanding of distinctions among the devices. I understand that for the purposes of FAA approval the existing categories may remain desirable—especially for manufacturers. But FAA inspectors, pilots, and instructors should not be confused about the practical application of ATDs for training and maintaining currency. On May 12, 2016, FAA published Regulatory Relief: Aviation Training Devices; Pilot Certification, Training, and Pilot Schools; and Other Provisions in the Federal Register. The final rule, which includes several changes from the NPRM, was published June 27, 2018. More details here. The proposed rule includes many significant changes to 14 CFR Parts 61 and 91 of interest to pilot and flight instructors. This rulemaking would relieve burdens on pilots seeking to obtain aeronautical experience, training, and certification by increasing the allowed use of aviation training devices. These training devices have proven to be an effective, safe, and affordable means of obtaining pilot experience. This rulemaking also would address changing technologies by accommodating the use of technically advanced airplanes as an alternative to the use of older complex single engine airplanes for the commercial pilot training and testing requirements…Finally, this rulemaking would include changes to some of the provisions established in an August 2009 final rule. These actions are necessary to bring the regulations in line with current needs and activities of the general aviation training community and pilots. As of early May 2018, however, the FAA has not published the final rule in the Federal Register. The proposal remains in limbo. For example, one proposed change would allow an instrument-rated pilot to use an approved aviation training device (ATD), flight training device (FTD), or full flight simulator (FFS) to fly approaches and other tasks to maintain IFR currency without having an instructor present. Currently, pilots who perform instrument recency experience requirements in an aircraft are not required to have an authorized instructor present to observe the time. Rather, the pilot can perform the required tasks in actual instrument conditions or in simulated instrument conditions with a safety pilot on board the aircraft. A pilot who accomplishes instrument recency experience in an FFS, FTD, or ATD, however, must have an authorized instructor present to observe the time and sign the pilot’s logbook. 14 CFR 61.51(g)(4). In revising § 61.57 in the 2009 final rule to include the option of using ATDs for meeting instrument recency experience, the preamble indicated that the FAA did not intend for an authorized instructor to be present during instrument recency experience performed in an FSTD or an ATD. It stated: “[A] person who is instrument current or is within the second 6-calendar month period * * * need not have a flight instructor or ground instructor present when accomplishing the approaches, holding, and course intercepting/tracking tasks of § 61.57(c)(1)(i), (ii), and (iii) in an approved flight training device or flight simulator.” 74 FR 42500, 42518. In 2010, the FAA issued a legal interpretation  stating that, based on the express language in § 61.51(g)(4), an instructor must be present in order for a pilot to accomplish instrument recency experience in an FSTD or ATD. That interpretation acknowledged, however, that the FAA had indicated in the 2009 preamble some intention to change the requirement but that the change was not reflected in the regulation. The FAA is proposing to amend § 61.51(g) by revising paragraph (g)(4) and adding a new paragraph (g)(5) to allow a pilot to accomplish instrument recency experience when using an FAA-approved FFS, FTD, or ATD—just as he or she might do when completing instrument recency experience in an aircraft—without an instructor present. Because instrument recency experience is not training, the FAA no longer believes it is necessary to have an instructor present when instrument recency experience is accomplished in an FSTD or ATD. An instrument-rated pilot has demonstrated proficiency during a practical test with an examiner. It can be expensive to hire an instructor to observe a pilot performing the instrument experience requirements solely to verify that the instrument recency experience was performed. As noted above, practice in an ATD has the distinct advantage of pause and review of pilot performance not available in an aircraft. As with instrument recency experience accomplished in an aircraft, the pilot would continue to be required to verify and document this time in his or her logbook. The FAA is retaining the requirement that an authorized instructor must be present in an FSTD or ATD when a pilot is logging time to meet the requirements of a certificate or rating, for example, under §§ 61.51(g)(4), 61.65 and 61.129. The FAA proposals would also eliminate much of the confusion about varying time intervals and tasks required when using a training device or simulator to maintain instrument currency. Currently, under § 61.57(c), to act as pilot in command (PIC) of an aircraft under instrument flight rules (IFR) or in weather conditions less than the minimums prescribed for visual flight rules (VFR), an instrument-rated pilot must accomplish instrument experience (often described as instrument practice, currency or recency) within a certain period preceding the month of the flight. If a pilot accomplishes the instrument recency experience in an aircraft, FFS, FTD, or a combination, then § 61.57(c)(1)-(2) requires that, within the preceding 6 months, the pilot must have performed: (1) Six instrument approaches; (2) holding procedures and tasks; and (3) intercepting and tracking courses through the use of navigational electronic systems. If a pilot accomplishes instrument experience exclusively in an ATD, then § 61.57(c)(3) requires that, within the preceding two months, the pilot must have performed the same tasks and maneuvers listed previously plus “two unusual attitude recoveries while in descending V ne airspeed condition and two unusual attitude recoveries while in an ascending stall speed condition.” 14 CFR 61.57(c)(3). Section 61.57(c)(3) also requires a minimum of three hours of instrument recency experience when using an ATD, whereas no minimum time requirement applies when using an aircraft, FFS, or FTD to accomplish the instrument experience. If a pilot accomplishes the instrument recency experience using an ATD in combination with using an FFS or FTD, then the pilot must—when using an ATD—perform the additional tasks but the “look back” period to act as PIC is six months rather than two months. 14 CFR 61.57(c)(5). The FAA stated in 2009 that the more restrictive time limitations and additional tasks were based on the fact that, at the time, ATDs represented new technology. The FAA is proposing to amend § 61.57(c) to allow pilots to accomplish instrument experience in ATDs at the same 6-month interval allowed for FFSs and FTDs. In addition, the FAA is proposing to no longer require those pilots who opt to use ATDs exclusively to accomplish instrument recency experience to complete a specific number of additional hours of instrument experience or additional tasks (in existing § 61.57(c)(3)) to remain current. As discussed previously, significant improvements in technology for these training devices have made it possible to allow pilots to use ATDs for instrument recency experience at the same frequency and task level as FSTDs. The FAA believes that this proposal would encourage pilots to maintain instrument currency, promote safety by expanding the options to maintain currency, and be cost saving. As proposed, a pilot would be permitted to complete instrument recency experience in any combination of aircraft, FFS, FTD, or ATD. Pilots training for a commercial pilot certificate with a single-engine-land rating or a certified flight instructor certificate would no longer have to train in a aircraft with retractable landing gear or use such an aircraft on the corresponding practical tests. Instead, FAA proposes to allow the use of technically advanced aircraft (TAA) for those purposes. Notwithstanding the previous use of terms such as glass cockpit and electronic flight instrument displays, the FAA is proposing to adopt an updated definition of “technically advanced airplane” in § 61.1 based on the common and essential components of advanced avionics systems equipped on the airplane, including a PFD, MFD and an integrated two axis autopilot. These components would be required in order to ensure the TAA used to meet the aeronautical experience requirements for commercial pilots in § 61.129(a)(3)(ii) and appendix D to part 141, as well as the related practical test standards, as amended, have the necessary level of complexity comparable to the traditional single engine complex airplane. TAA would be required to include a PFD that is an electronic display integrating all of the following flight instruments together: An airspeed indicator, turn coordinator, attitude indicator, heading indicator, altimeter, and vertical speed indicator. Additionally, an independent MFD must be installed that provides a GPS with moving map navigation system and an integrated two axis autopilot. In general, the pilot interfaces with one or more computers in order to operate, navigate, or communicate. The proposed definition of TAA would apply to permanently-installed equipment and would not apply to any portable electronic device. The FAA recognizes the continuing advancements in aircraft avionics and the need for a pilot to be proficient with modern cockpit equipment and automation. As proposed, the FAA would define the term TAA as an airplane with an electronic PFD and an MFD that includes, at a minimum, a GPS moving map navigation and integrated two-axis autopilot. In addition to adding a definition of TAA to § 61.1, the FAA is proposing to amend the existing training requirements to permit the use of a TAA instead of a complex or turbine-powered airplane by commercial pilot applicants seeking an airplane category single engine class rating. In addition to the regulatory changes, the FAA would revise the practical test standards for commercial pilot applicants and flight instructors seeking an airplane category single engine class rating. 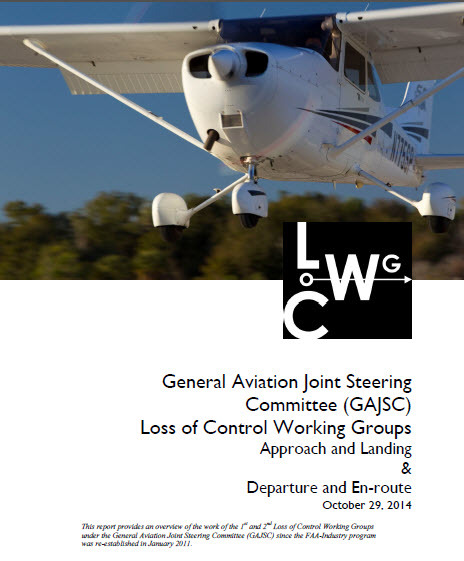 AOPA has a story about a report to the General Aviation Joint Steering Committee (GAJSC) concerning loss-of-control accidents. The detailed report is available at the preceding link.